At AlwaysFreshFish.com we buy only the freshest "Yellow tail" or "Blackback" Flounders from the North Atlantic waters of the United States and Canada. 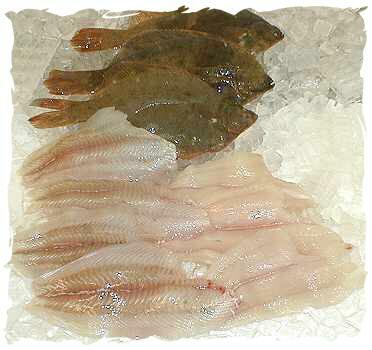 These fresh Flounders are shipped to us daily when available. AlwaysFreshFish.com processes these Flounders into fillets for the restaurant, retail markets, and institutional trade. We are now offering our fresh flounder fillets for sale directly to the public! Fresh Flounder fillets are skinless and have a creamy to white colored flesh with a mild light flavor and a small flake when cooked. Flounder is a very delicately flavored fish that is a favorite the world over. Fresh Flounder fillet size will average between 2-4 ounces. 1 lb. Fresh Flounder + 4 lbs. Add. Selections = 5 lb. Total Order OK! Rinse Flounder fillets under cold water and let drain. In a mixing bowl combine Flour, Black Pepper, and Garlic Powder. Beat Eggs in a separate bowl. Cover fillets with Flour mixture. Dip into egg mixture and again in flour. Melt Butter and Olive Oil in a skillet. For additional information on Fresh Flounder, please e-mail AlwaysFreshFish.com.